Unless you've been stranded in the Mato Grosso for the past six years you'll probably know something of Paul Oakenfold. As a D.J. 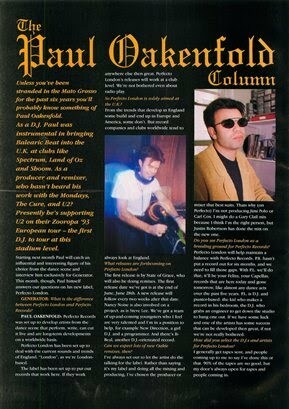 Paul was instrumental in bringing Balearic Beat into the U.K. at clubs like Spectrum, Land of Oz and Shoom. As a producer and remixer, who hasn't heard his work with the Mondays, The Cure, and U2? 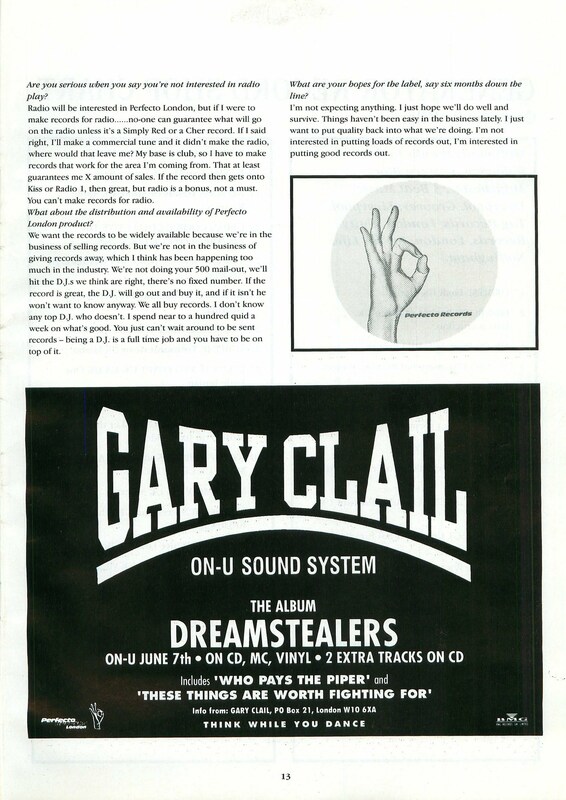 Presently he's supporting U2 on their Zooropa '93 European tour – the first D.J. to tour at this stadium level. 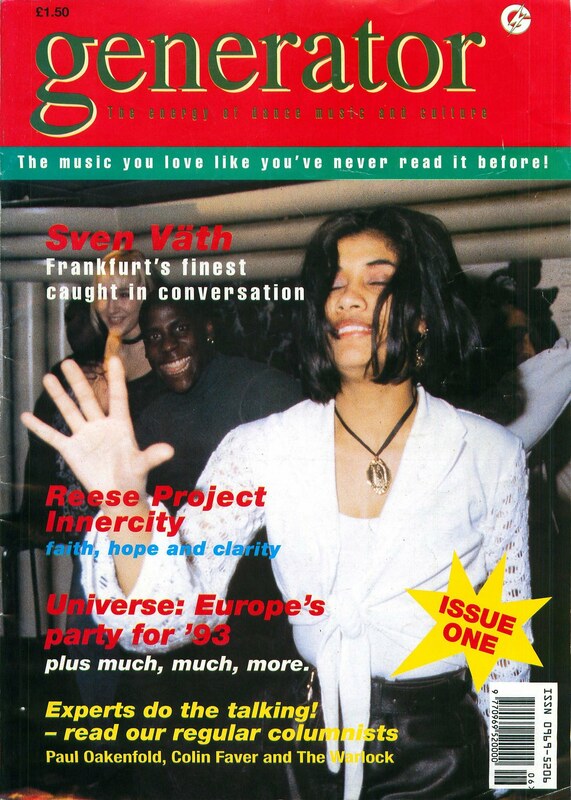 Starting next month Paul will catch an influential and interesting figure of his choice from the dance scene and interview him exclusively for Generator. 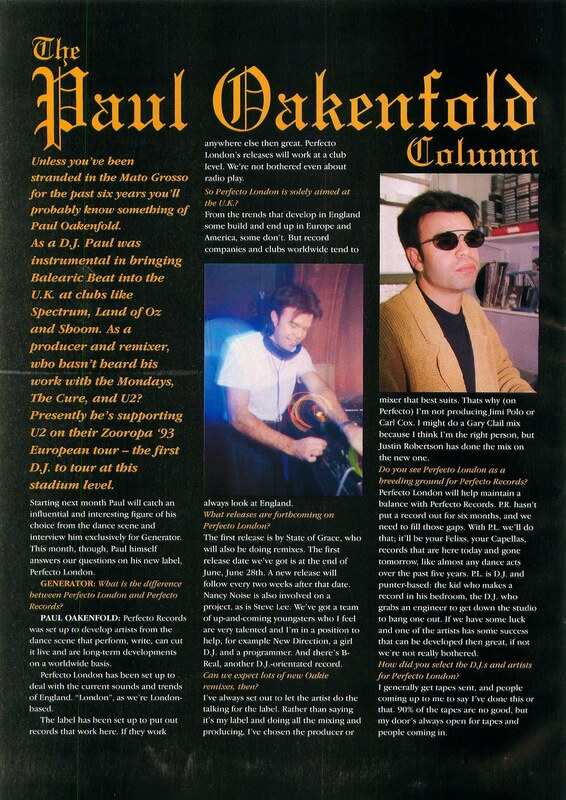 This month, though, Paul himself answers our questions on his new label, Perfecto London. GENERATOR: What is the difference between Perfecto London and Perfecto Records? PAUL OAKENFOLD: Perfecto Records was set up to develop artists from the dance scene that perform, write, can cut it live and are long-term developments on a worldwide basis. Perfecto London has been set up to deal with the current sounds and trends of England. "London", as we're London-based. The label has been set up to put out records that work here. If they work anywhere else then great. Perfecto London's releases will work at a club level. We're not bothered even about radio play. So Perfecto London is solely aimed at the U.K.? From the trends that develop in England some build and end up in Europe and America, some don't. But record companies and clubs worldwide tend to always look at England. What releases are forthcoming on Perfecto London? The first release is by State of Grace, who will also be doing remixes. The first release date we've got is at the end of June, June 28th. A new release will follow every two weeks after that date. Nancy Noise is also involved on a project, as is Steve Lee. We've got a team of up-and-coming youngsters who I feel are very talented and I'm in a position to help, for example New Direction, a girl D.J. and a programmer. And there's B-Real, another D.J.-orientated record. Can we expect lots of new Oakie remixes, then? I've always set out to let the artist do the talking for the label. Rather than saying it's my label and doing all the mixing and producing, I've chosen the producer or mixer that best suits. Thats why (on Perfecto) I'm not producing Jimi Polo or Carl Cox. 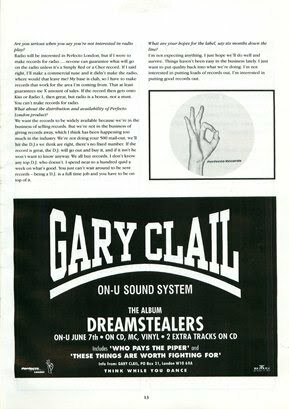 I might do a Gary Clail mix because I think I'm the right person, but Justin Robertson has done the mix on the new one. Do you see Perfecto London as a breeding ground for Perfecto Records? Perfecto London will help maintain a balance with Perfecto Records. P.R. hasn't put a record out for six months, and we need to fill those gaps. With P.L. we'll do that; it'll be your Felixs, your Capellas, records that are here today and gone tomorrow, like almost any dance acts over the past five years. P.L. is D.J. and punter-based: the kid who makes a record in his bedroom, the D.J. who grabs an engineer to get down the studio to bang one out. If we have some luck and one of the artists has some success that can be developed then great, if not we're not really bothered. How did you select the D.J.s and artists for Perfecto London? I generally get tapes sent, and people coming up to me to say I've done this or that. 90% of the tapes are no good, but my door's always open for tapes and people coming in. Are you serious when you say you're not interested in radio play? Radio will be interested in Perfecto London, but if I were to go make records for radio......no-one can guarantee what will go on the radio unless it's a Simply Red or a Cher record. If I said right, I'll make a commercial tune and it didn't make the radio, where would that leave me? My base is club, so I have to make records that work for the area I'm coming from. That at least guarantees me X amount of sales. If the record then gets onto Kiss or Radio 1, then great, but radio is a bonus, not a must. You can't make records for radio. What about the distribution and availability of Perfecto London product? We want the records to be widely available because we're in the business of selling records. But we're not in the business of giving records away, which I think has been happening too much in the industry. We're not doing your 500 mail-out, we'll hit the D.J.s we think are right, there's no fixed number. If the record is great, the D.J. will go out and buy it, and if it isn't he won't want to know anyway. We all buy records. I don't know any top D.J. who doesn't. I spend near to a hundred quid a week on what's good. You just can't wait around to be sent records – being a D.J. is a full time job and you have to be on top of it. What are your hopes for the label, say six months down the line? I'm not expecting anything. I just hope we'll do well and survive. Things haven't been easy in the business lately. I just want to put quality back into what we're doing. I'm not interested in putting loads of records out, I'm interested in putting good records out.